^ Jain, Sharad K.; Agarwal, Pushpendra K.; Singh, Vijay P. Hydrology and water resources of India. Springer. 2007: 341 [26 April 2011]. ISBN 978-1-4020-5179-1. 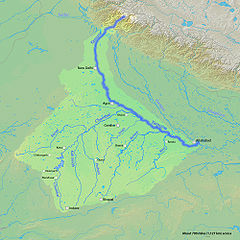 ^ 'Ganga is the most polluted river'. The Hindu. Nov 23, 2003 [2017-07-03]. （原始内容存档于2008-09-15）.